If you work in Nottingham's Creative Quarter, centred in the historic Lace Market area, you'll quickly find you're spoilt for choice when it comes to dining out. All this variety can make popping out for a quick lunch hour a tricky task. But don't worry our resident foodie, Sylvia, has compiled a guide to some of the area's top eateries to help you decide where to go. A relatively new addition to the Hockley area, Hartley's is a traditional family-run café serving homemade specials, breakfasts and heartily-filled sandwiches. If you're a secret fan of greasy spoons, Hartley's may be the place for you, serving full English breakfasts all day from 8am. They also offer bagels with sumptuous toppings such as smoked salmon and scrambled egg, toasted sandwiches and a range of deli-style baguettes and paninis. For the health-conscious there's a variety of salad boxes and smoothies. On top of all this, you can enjoy a good range of hot drinks available including luxury hot chocolate and flavoured syrup shots. In the heart of the Creative Quarter is the huge, impressive and historically important St Mary's Church and in its shadow lies the glorious Hungry Pumpkin deli café on High Pavement. It is so tiny it may take a couple of trips before you actually get in especially at lunchtime but it is worth the effort. With Michelle in charge the Hungry's continental ambience and menu will transport you across the Channel in no time. The food and drink is highly acclaimed by newspapers and restaurant guides, including TripAdvisor, surprisingly making it one of the top eating places to visit in Nottingham. Their menu ranges from exciting sandwich fillings, to indulgent salads, to quirky specials and they can even deliver pre-ordered business lunches to your desktop. You can also buy a small range of deli favourites from them which, complete with luxury specialty treats, make for a great day. If it's Friday you might be tempted to indulge in a liquid lunch, but with some of the finest pub grub available in the city, you won't be able to turn down the food at these Lace Market public houses. With its cosy, almost country-pub atmosphere, the Kean's Head is a small but exceptionally popular pub again near St Mary's Church. You'll run into lots of creative and business names here, so it's a great spot for networking. Not only that, but this Castle Rock Brewery establishment boasts some seriously tasty food and a range of enticing beverages. A fixed menu of delicious homemade staples, such as doorstop sandwiches, pizzas and bar snacks, is accompanied by a regularly updated specials board which features a wide selection of hearty belly-fillers made with high quality and usually locally-sourced ingredients. This stylish bar really makes an impact, being situated in a deconsecrated 17th century church. Many of the original features of the grade II listed building have been kept, including the stunning stained glass windows and impressive vaulted roof. The bar is trendy and up-beat, working in perfect counterpoint to the historic architecture. Their menu comprises a broad selection of British classics. At the weekends this can be a hugely packed and busy place but to appreciate the architecture and design (and impress mum or clients visiting Nottingham) then day time or early doors is best. This refurbished Victorian alehouse at the side of the newly refurbished and posh Lace Market Hotel serves up a menu of British gastro pub classics such as beer-battered fish and chips, award-winning bangers and mash, and homemade beef burgers. The place is basically a traditional pub, packed with character, with cosy nooks and corners and a collection of vintage furniture. The bar serves plenty of real ales and good quality wines at reasonable prices. The Broadway cinema is an important independent movie theatre in the heart of Hockley. As a cinema, it is known for showing off-beat, indie and foreign films as well as the normal list of blockbusters. But if you don't have time to take in a movie, the Broadway's chic, modern café bar is a great place for a quick lunch. They offer a range of blackboard specials from around the world and a great selection of wines, spirits and beers, including their own Broadway Reel Ale. Look out for their occasional limited time-only themed menus which are inspired by films being shown on their big screens. The Creative Corner is crammed full of top restaurants featuring food from all over the world, so if you're after a more formal sit-down meal you won't have far to go. The restaurant is the statement piece of this amazing property, the Head Chef has been charged with creating an aspirational dining experience and a design that leaves even the most discerning diner happy. This up-market restaurant boasts an extensive menu of high quality and classic ingredients. A recent SquareMeal review described what's on offer as follows "Simple lunch dishes such as a tart of salt cod and sardines with black olives and courgette pesto, or slow-braised beef ribs with spiced carrot, pickled mushrooms and ‘salt & vinegar’ chips are particularly well executed. The kitchen flexes its muscles for more elaborate, adventurous ideas in the evening, maybe spiced lamb’s sweetbreads and braised pork belly with sweet potato, cashews and pak choy, or braised halibut teamed with fennel hearts, leeks, turnip fondant, cockle vinaigrette and chicken jus". This very quirky but very authentic canteen style restaurant can be a real treat if it's not totally packed with the local Chinese population of Nottingham's unofficial China Town in the Hockley area of the Creative Quarter. The owners say the cuisine here is traditional Cantonese style, typical of what you would find in Hong Kong. Various local and national reviews suggest it is widely regarded as the best authentic Chinese restaurant in the East Midlands. Their menu has over 250 dishes, as well as a wide range of drinks, not all of it well known to western diners. They say they are also very proud to bring out a wide variety of authentic hot and spicy Sichuan cuisine, specifically designed to the Mainland Chinese Taste. You would expect to find all your favourite dishes, ranging from the Sweet & Sours and Sizzlers to live seafood such as Lobster, Crabs & Scallops. This well established and highly acclaimed world tapas restaurant captures the flamboyancy of Spanish dining whilst bringing a whole new set of flavours to the table. Each delicate plate is carefully and stylishly arranged to create a wonderfully varied and modern dining experience. The main restaurant is in a grade II listed building, situated next to the Galleries of Justice museum that has been tastefully transformed into a relaxing and intimate dining area that is Michelin rated. For a more relaxed bar style experience go across St Mary's Church and into the lively Hockley area and try their newly opened sister restaurant Bar Iberico. Sometimes no matter how hard you try you just can't get away from the desk. If you need to bring something back to the office, the following places, as well as the lovely Hungry Pumpkin already mentioned above, offer a good range of takeaway options. This lively, fast and convenient noodle bar offers a tasty menu with plenty of room for customisation. Choose from generous small, medium or large portions served in authentic cartons, plus a selection of delicious sides. Wok&Go is simple but satisfying, with fast and efficient service and a good variety of fusion Asian flavours. As a plus, you can also order online or over the phone. Sometimes you just can't beat a sandwich. 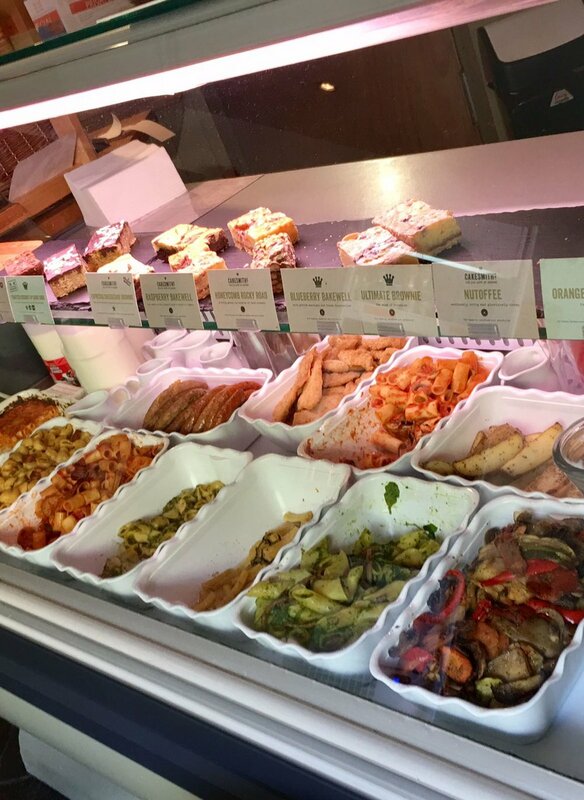 Flavours is a long established traditional sandwich shop, offering a range of classic fillings, salad boxes, jacket potatoes and breakfast items. You can eat in the small seating area upstairs, but Flavours is best known as a takeaway café. The nation's favourite sushi restaurant is just round the corner from the Lace Market and on top of its dining in option, it offers a great takeaway service. At Yo! you can be sure the food will be fresh and ethically sourced, as well as healthy and delicious. Pop in and pick up one of their platters, boxes or packs of sashimi, or you can pre-order over the phone or online.